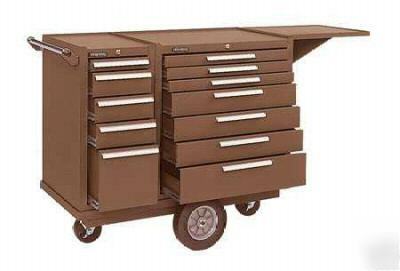 * Includes 5 drawers, two 10” ball bearing wheels with solid rubber tires and two 5” swivel casters with toe locks. * 20-1/4W x 43-1/8D x 35”H. * Includes side handle and 5” casters. * 20-1/8W x 17-1/4D x 1”H. · All of our items are new and never used. · All machinery returns will be subjected to inspection at our warehouse. · Please do not have unauthorized repair work done to items. · Unauthorized repair work, alterations, modifications, misuse or operation of item, not in accordance with instructions provided, will result in loss of return privileges and will void warranty.